To overcome your fear of selling learn from your experience. Don’t get too distracted by all the options and all the money-making potential. Selling is not reserved for “salespeople.” We are all salesmen and saleswomen. It’s time to overcome your fear of selling. People who sell things come in all shapes, sizes, and varieties. You’ve probably purchased something from one of them in the past hour/day/week (without thinking you were buying from a salesman/woman). Every time you spend a dollar, it’s because someone convinced you that you needed to buy that thing. Unless it’s food. Then you don’t need convincing because that’s just survival. Well, maybe not donuts? Actually, yes. Donuts = Survival. Acknowledge your assumptions but don’t let them dictate your decisions. We assume we know what it means to sell, and as a result, we never bother to learn what it actually means. What’s worse, we fail to differentiate it from selling out. The two are very different. Selling out is getting paid for doing something you don’t enjoy. But if you’re selling something you believe in? If you’re offering a product, service, or opportunity you’ve created and want others to be helped by? That’s not selling out. That’s just selling. And that’s your job. So let’s talk about doing your job. There are so many ways you can sell something, especially online. It’s incredibly helpful to pick a selling schedule that works for you. Here are some that have worked for me, currently and in the past. Sell something for a certain amount of time (say, one week), and then “close the cart.” Assess how things went, especially if it’s a new product or your first time selling. Having an open-and-closed launch (annually or on any other schedule) can create urgency and scarcity for your customers while allowing you to maintain a nice work-life balance: busy during launch, and then off enjoying your life the rest of the time. Selling via open-and-closed launches is also great because it puts you in control of when you need to spend time being in the selling mindset. No one wants to be selling all the time (sorry Alec Baldwin). Evergreen products are great in theory, but I caution you with this option. While the idea of a set-it-and-forget-it sales schedule is wonderful to think about, it 99% of the time requires ongoing attention and effort. If you want to have your product or service for sale all the time, that’s a perfectly fine option. Just know that you’ll most likely need to do quarterly promotions or mini-launches throughout the year to see a spike in sales. But hey, you get to control those spikes, so that’s a good thing! Ahh, the anti-schedule! Create a sales cycle on your calendar that gives you something to stick to and look forward to. I tend to loosely plan out my product launches 3-6 months in advance. These can be put on the calendar and moved around as you see fit. But doing the initial planning will help you have some semblance of an idea of what’s on your sales plate (which is obviously made of very expensive and ancient materials). No matter what sales schedule you decide to use, you can always change it. You can always mix things up and learn from your experiences. The most important part is that you sell and give people the opportunity to put money in your bank account for the thing you are creating. No one, and I mean no one, just puts up a sales page and has money rain down upon them. We’ve all seen the Kickstarter campaigns that bring in millions of dollars, and it looks like they hit it big overnight. But those uber-successful campaigns? They had months and months of pre-marketing, I promise you. Many of them are brands that have built small niche audiences and have found a product that works and sells well in small doses first. When I launched BuyMyFuture in 2015, it was an open-and-closed launch. It may have looked to people seeing it during the 2-week sales window like it just appeared out of nowhere, all ready to go, but that’s not the case at all. From the initial idea to official launch, I spent 4 months getting ready for a 14-day sale. If you put in part-time effort, expect part-time results. *49 phone (or Skype) calls is A LOT. You don’t need to do this many. I’d recommend 5-10 calls, but be sure these folks are your ideal customers for what you are selling. (That means don’t have a call with your mom unless you’re selling a product targeted to people like your mom). Tell them about your product/service, and listen to how they repeat your project back to you and the words they use. Also, listen for what features or benefits stand out to them, and make sure to highlight those when you’re selling. I believe email marketing is the absolute best way to sell something right now. Don’t waste time on social media. Don’t waste time or money paying for ads*. Build a quality email list of highly interested people, and sell directly to those people. *Paid advertising is great for products that are already selling, or if you know an expert in the paid marketing world. Sure, Facebook Ads seem attractive, but they can be a huge distraction and waste of money if you don’t know what you are doing and don’t have a product that people are willing to pay for. What problem is your product or service going to solve for your potential customer? Did it solve that problem for you? Share that story! People love to hear stories, especially ones they can relate to. Example: I co-created an online course about starting a podcast and making money from it. The course was everything I’ve learned about podcasting and making real money with a podcast. 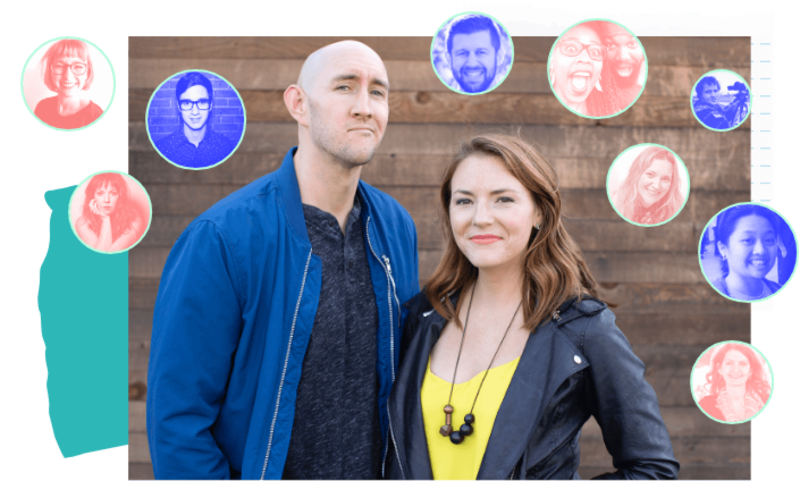 In the course, my co-creators and I share our personal podcast experiences, lessons learned, biggest mistakes, and actionable tips and tricks. Does your product or service do something unique? It better. If it doesn’t, it’s not going to stand out, no matter how many emails you send to people about it. Find the unique angle. Hint: It’s usually something your potential customers will point out to you (which you’ll find out on your customer calls). If you don’t have any customers to call, find some! You want to learn how to talk about your product during the pre-marketing stage before you start putting a ton of effort into selling. Open-and-closed cart? A timed discount? Annual launch? A limited number of sales? These are things that create urgency and scarcity. These will motivate people to make a purchase. Do not, however, say something is “only available for the next week” if people will still be able to find it a week or two later. That’s bad business, and it will hurt your reputation. The day before: Launch is coming tomorrow! Feel free to share the details of the product/service and the cost, or you can save these for launch day. Launch day: Your thing is available! (Get your mind out of the gutter.) Don’t just say “Buy Now!” but bring some story or problem-solving example into the email. Then make sure you have multiple Buy links throughout the email. Day 3: Relatable stories or testimonials from people who’ve used your product and seen actual benefits from it (this could be your own story too). Day 7: This is a great time for a mid-launch bonus. You can plan ahead to do this! Have something cool you can add for people who buy? Include it in this email. You can also include some buyer testimonials (or simple quotes). Also, you should give this bonus to all buyers who’ve already purchased or will purchase. Day 13: The cart is closing tomorrow! Have another story to share about the uniqueness or awesomeness of your product or service? Share it. Remind people the cart is closing tomorrow. Last day (morning): This is it! Urgency! Scarcity! AHHHH! Last day (evening, people who clicked only): This is for the ConvertKit tag I’ll mention in a moment. It’s one final call to action to buy and it works. *This schedule assumes that you’ve done lots of pre-marketing. Pre-marketing could include many mentions of your launch date leading up. You could mention it as early as 6 months ahead of time if you like, but do at least 1 month of lead-up mentions in your emails. One thing that can create a lot of complications and consternation is trying to automate things too early. I’ve seen it time and time again. People shoot themselves in their email marketing feet because they try to overdo all the email automation stuff. Sure, if you know how to do this stuff, continue reading this section, but if you’re new to Email Marketing Land, it might be best to skip this. I’m going to mention tactics for ConvertKit, since it’s an email marketing platform I used for years (I’m sure you can use similar tactics, like segmenting and tagging, with other email providers). Setup a new Tag called “ProductName – Clicked.” Then, create a new Automation for a Link Trigger. The link should go to the sales page for your product/service, and when clicked, it should add the new tag you just created (ProductName – Clicked). Setup a new Tag called “ProductName – Purchased.” If you’re using Gumroad to sell things, ConvertKit makes it super easy to create an automation that adds a tag. You can also use Zapier.com to create an automation to add the purchase tag if you sell using Stripe (and other payment processors). You can also manually add the tag as people purchase. If this is blowing your mind, that’s okay. You don’t need to do any automation stuff when selling. It’s nice to have. Any time you link to your sales page in your email broadcasts, make sure to use the Link Trigger you created. This will continue to collect clicks (potential buyers!) and add them to the “ProductName – Clicked” tag you created (more in the next step). When you set up your sales emails, go ahead and send them to your full email list, but when you’re selecting your subscribers for a new broadcast, add the filter group “Matching none” and select your “ProductName – Purchased” tag. This will exclude people who’ve already purchased from getting the rest of your sales emails. I like to send this final sales email broadcast only to the folks who’ve clicked the sales page link in previous emails. You’d be shocked at how many people just need a final nudge, and the ones who will become paying customers are the ones who’ve already shown interest (clicked!). In the final broadcast, select to send only to subscribers with the tag “ProductName – Clicked.” You can even mention that you know they clicked (which is Internet wizardry) and that this is their very final chance to buy the thing they showed some interest in. 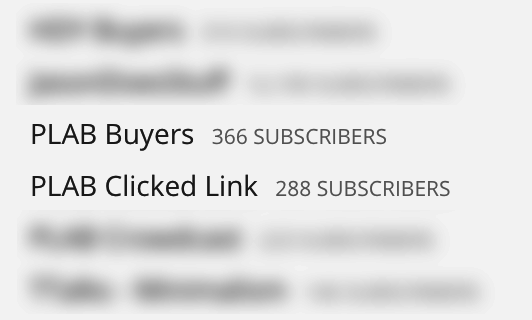 The good thing about creating subscriber tags is that you can use them for future launches and future sales emails. You’d be shocked at how a simple sentence in an email or on social media can help to get your existing audience to assist you in sharing the thing you are selling. An important note to consider: Is what you are selling interesting? Because, be honest with yourself, you don’t share things that aren’t interesting, either. Don’t get crazy and write “pls RT” after every tweet. Don’t hit up all your friends on FB Chat and ask them to share your status. Just make a simple ask and let people help you out if they want to help you. Word of mouth is powerful, but organic word of mouth is the MOST powerful. Sure, making the simple ask is okay, but it’s also okay to give people the benefit of the doubt that they’ll help you if they find what you’re selling interesting enough. Truthfully, I don’t do a lot of affiliate marketing with my audience, so I wouldn’t be the best source of information for this. If people are asking you if they can help you sell your products/services as affiliates, then you may want to investigate this further. Selling, I hope you can see now, is just the next step to take after you create something. It’s not a crazy scary mountain or a boogeyman in the closet. Information is power against any fear. But… you might be overwhelmed? That’s okay! And normal. The point here is to show you a bunch of options. To lay a handful of ideas (that work) out on the table for you. Information is power against any fear and the best part is that you don’t even have to do all this stuff. You get to treat this article like a Sizzler Buffet and choose the items that make the most sense for you and the way you want to sell your product or service. The last thing I want to mention is being okay with a smaller launch when you’re new to selling. Learn from your experience. Don’t get too distracted by all the options and all the money-making potential. The money will come. Focus on getting your first sale. Then your second. Then your third. Treat your customers amazingly well, and go above and beyond for them. The rest of your sales will come with time. If you’ve been selling things for awhile, maybe you now have some fresh ideas? Maybe you’ve gained a few nuggets of information that create more income for you? Great! Stop reading (conveniently, we’re at the end), and start working on implementing those ideas. To overcome your fear of selling use a launch schedule that works for you, put time and effort in the pre-marketing, and don't focus on trying to sell to everyone.